We pay out each 5.000 blocks and we check that each day. Also we will expand the payout with more different coins in the future! This may vary in different tokens where and amount of it! WavesAssist group is here to Assist the Wavesplatform and all Project on it! We listen very close to the community of waves for new improvements or when we do need to vote for new features released on the wavesplatform. WavesAssist is constantly looking for new collaboration with different kind of project so if you are a project and need some help/attention just contact us! Because we are still a small node, we need more leasers!! So please inform people to lease their waves to our node (or a share of it)! We do support the decentralization of the Wavesplatform so when we became bigger we will help other small nodes to grow. This will benefit the strength of the Wavesplatform! When it is necessary to decrease the pay-out, we will inform all our leasers! This because (for example) we want to use the delivered value for new improvements. There it is the first payment!!! Thank you all for Leasing at WavesSupporters! What day of the week generates the profits? From now on it will be done every Saturday !! If there is something wrong it will be done Sunday. Why there is no MRT? According to w8io, there is 88.10 MRT to pay for this period. The real answer is that I did not knew the exact way to pay out MRT aswell… I have look into it and I will pay out 5 MRT for each mined block. Also edit the description above where I explain that when the node will be bigger the MRT reward will be higher so everybody will have benefits when this node will grow !! Normally the payment is in the weekend but I saw that I forget some of last week so I ran the payment ones more ! If do not pay 100% MRT why do you declare 100% payout in the topic header? It looks like a lie or clickbait. The fee is different with a mass payment so weekly is fine enough. Next to that it is much easier to manage the payments. Unfortunately the payment did crashed because 10.000 blocks is to heavy, so we choose to changed this to 5.000 blocks. 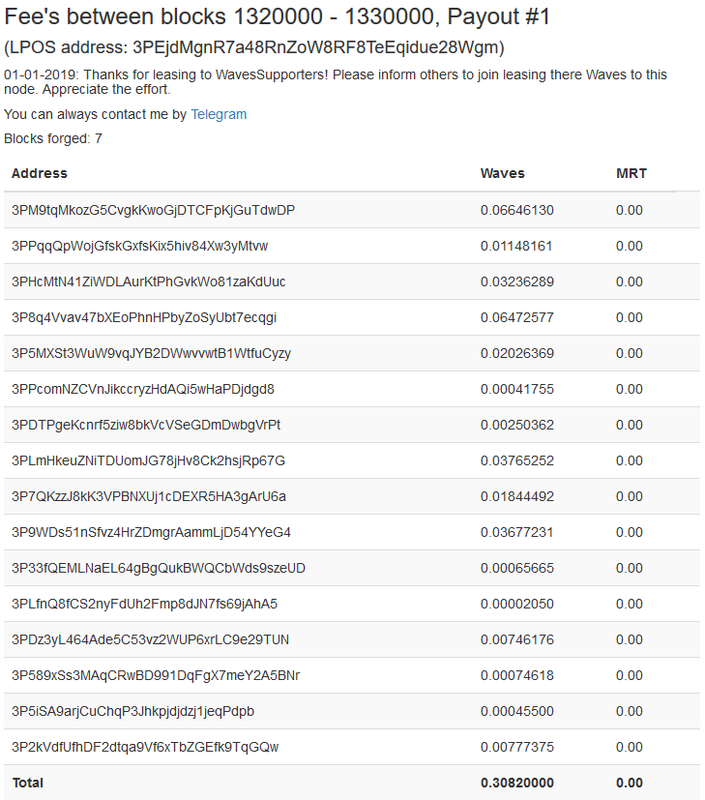 So for the last 10.000 blocks it is divided into 2 payments / 6 and 7. !!! Payout #6 and #7 !! !